BAGHDAD (AP) — The Islamic State group has launched two chemical attacks near the northern Iraqi city of Kirkuk, killing a three-year-old girl, wounding some 600 people and causing hundreds more to flee, Iraqi officials said Saturday. "What the Daesh terrorist gangs did in the city of Taza will not go unpunished," Iraqi Prime Minister Haider al-Abadi said using an alternative acronym for the IS group during a meeting with village elders in Taza on Saturday. "The perpetrators will pay dearly." Sameer Wais, whose daughter Fatima was killed in the attack, is a member of a Shiite militia fighting IS in Kirkuk province. He said he was on duty at the frontline when the attack occurred early in the morning, quickly ran home and said he could still smell the chemicals in the rocket. The U.S.-led coalition said the chemicals IS has so far used include chlorine and a low-grade sulfur mustard which is not very potent. "It's a legitimate threat. It's not a high threat. We're not, frankly, losing too much sleep over it," U.S. Army Col. Steve Warren told reporters Friday. The coalition began targeting IS' chemical weapons infrastructure with airstrikes and special operations raids two months ago, Iraqi intelligence officials and a Western security official in Baghdad told the AP. Separately, attacks across Baghdad Saturday killed 13 and wounded 27. The attacks were mostly carried out with homemade bombs placed along roads in the capital's southern and eastern neighborhoods. 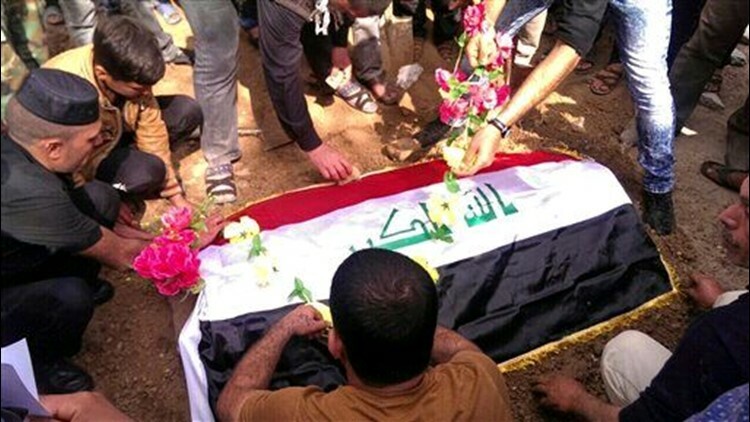 There were no immediate claims of responsibility, but the Islamic State group often claims responsibility for bomb attacks in the Iraq capital targeting civilians. As the group has endured territorial losses in Iraq — most recently the city of Ramadi which was declared "fully liberated" by Iraqi and U.S. officials last month — they have stepped up insurgent style attacks in Baghdad and other areas far from the front lines. Hamish De Bretton Gordon, a former British army officer and chemical weapons expert, says the use of chemical weapons by IS also appears to be linked to losses on the battlefield. The mustard agent that IS is using is not very toxic, Gordon says, but "it has a huge physiological impact that far outweighs its physical impacts." Fatima's father Wais said he was planning to return to the frontline with IS as soon as possible. "Now I will fight Daesh more than before, for Fatima." Associated Press writer Susannah George in Baghdad, and Salar Salim in Irbil, Iraq contributed to this report.